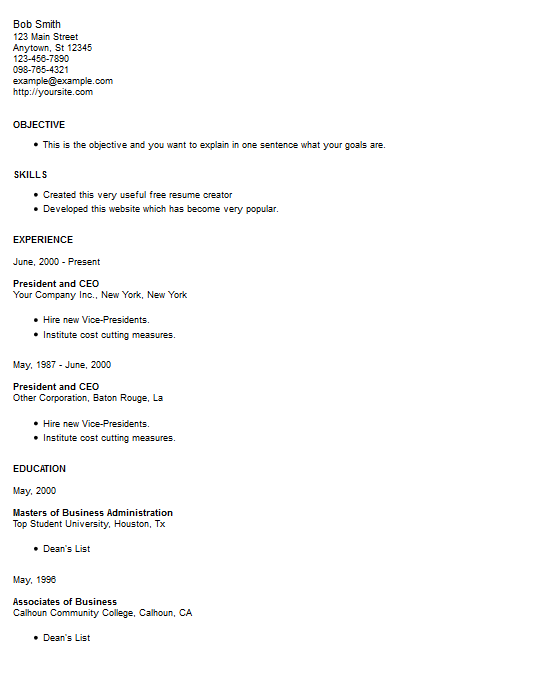 Resume Template Style 11 is one of our template styles from the Resume4Free Free Resume Management System. You can get this resume template, style eleven or choose from many others that are provided by our Free Resume Management System. The level of customization provided by this system is top-notch enabling you to write a first-class resume and cover letter. There are many more essential documents available to further your career goals all of which can be created for free within the system. The sections in this template show the dates first then the job titles and degree titles next. This would bring more attention to the chronology and titles of each section. If your date consistency is important for you to mention this could be a good style for you. Style Eleven is a variation of some of our other templates, it may look the same as some of our other templates, but there are minor differences that do have an impact on how your information is received. The various elements of each section were switched around, different parts are shown first, are made to be larger or are bold face. Please export this style from our free resume creator, if you need a cover letter or reference page you can get them all in this same style.